I love tellin’ ya about new titles. The last few days we’ve highlighted some random titles. I didn’t write a big ol’ essay about why they are important for God’s Kingdom or or how they will enhance Christ’s glory as we become more thoughtful readers or how rare some of these titles might be in other stores. No, no. I just listed some. Here’s more, all offered at 25% off. Im tellin’ ya: it’s like March madness. Spread the word. Give us a call or send an email to inquiry or order. A People’s History of Christianity: The Other Side of the Story Diana Butler Bass (HarperOne) $25.99 I hope you know Diana as an eloquent writer, a person who speaks, often beautifully, of new ways of seeing God’s work in God’s churches, and how old ways and historic, if distinctive, spiritual practices are renewing mainline parishes. I’d read anything of hers, and have said so, often. Here is her brand new one, a bit different than her memoir-ish telling of stories of congregational life, even if she has not lost her charm as a writer, the personal insight, the intimate detail. This is, in fact, a church history, but it is kinda like Howard Zinn mashup with Justo Gonzalez. Or Philip Jenkins writing with Dorothy Day looking over his shoulder. D.B. 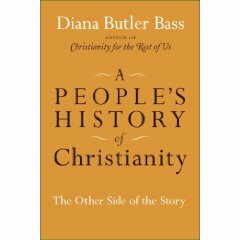 Bass’ A People’s History… walks us well through several different epochs of church history and rather than defining those periods by their doctrine, ecclesiastical disputes or debates about dogma, she shows—powerfully—how folks practiced their piety. And their ethics. This formula for each section of describing common people, key leaders, and the spiritual tone of their journeys inward and outward—their prayer and their politics—is really useful. And very enlightening. Some big-wig church historians have raved about Bass’ work (“raises new kinds of questions, illumines neglected themes, prompts reassessments of familiar topics and draws the reader into fresh forms of engagement with the history” says E. Brooks Holifield of Emory.) Less academic folk who are great writers, with their feet on the ground, in service ministries among the poor—Sarah Miles, say, or Shane Claiborne—have also raved noting that it is “intelligent and sassy” and helps us live more faithfully in light of these past ways of being God’s people. That is, while I think any church history could be helpful to deepen our discipleship in faithful ways, this one really is very useful! Pultizer Prize winning author of What Hath God Wrought even writes, “The curious but hesitant reader who wonders whether Christianity just might have something in it for them will that the answer is YES.” Amen to that. What a great, rare, book. Highly recommended. 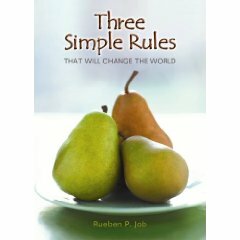 Three Simple Rules That Will Change the World Reuben P. Job (Abingdon) $8.95 You may know Jobs from his wonderful work doing A Guide to Prayer for All God’s People, and two other liturgically-themed daily devotionals. As a former editor of the Upper Room publishing ministry, he is well aware of the deepest hungers for spiritual formation, and has help offer wonderfully-written volumes. Here, he offers a simple, nearly pocket sized handsome hardback, a more ecumenical version of a small book the United Methodists used last year. Three Simple Rules are from John Wesley, and offer us a practice of “a way of living that is in harmony with the life of Jesus” allows us to survive in and thrive in a world like ours. (The three rules are “Do No Harm”, “Do Good” and “Stay in Love With God.” What a great little book. Abingdon has also released a DVD with Reuben Jobs and adult six-session study book for small groups ($7.00.) They’ve also done a teen version Three Simple Rules 24/7 ($7.00 and a Leaders Guide for $7.00) and even a kids edition (Three Simple Rules for Following Jesus: A Six Week Study for Children ($15.95). This is very cool stuff, thoughtful but practical. The whole church could do it together. Give us a call or email if you want info on any of them. Insights: Karl Barth’s Reflections on the Life of Faith Karl Barth (WJK) $14.95. There may be other such daily devotionals, but I don’t know of any. Here, you can dip in to Barth’s lucid thoughts, in cogently gathered short readings, each based on a Biblical text. These are taken from across his wide body of work, making it a perfect introduction. One reviewed suggested these are great to stimulate prayer. Another called them “winsome.” One-page, vibrant selections of the most important theologian of the last several hundred years**. Should be in every church library, at least! Deepest Differences: A Christian Atheist Dialogue James Sire & Carl Peraino (IVP) $15.00 I don’t know about you but I am growing a wee bit tired of the oodles of books by thoughtful Christians responding to the nasty “new atheism” intellectuals (like Dawkins, Hitchens, et al.) Okay, I even know some of the authors that have written them, and most are quite good. Here, though, is a book I’ve been waiting a year for, since Jim Sire told me about this friendly, honest, deep conversation he was having over email with a nearby atheist neighbor. Only Sire could be this thoughtful, and whimsical, this overt in defending the historic gospel, all the while being this impish, dear, good man. Surely professor Peraino knew he was grappling with a famous worldview scholar, apologist and author? Maybe not at first. The letters unfold and we are all are in their debt. Thanks to the two of them, and to the publisher, for allowing us to listen in to this friendly, deep dialogue without clear-cut answers to difficult questions. ry culture. We stock all of their releases, and this just came. They’ve done marvelous books, academic stuff and less scholarly work, too, almost all of impeccable scholarship and taste, interesting and important. There are more basic introductions to the coherence of the Catholic social ethic, but I doubt if you’ll find a more interesting, thoughtful, and important collection. This weaves defty between Augustine and Aquinas, Scripture and Eucharist, peace, abortion, human rights, civic life and the deep spirituality of this venerable tradition. (Baker) $17.99 It may be that J.I Packer wrote one of the best books on the characteristics of God (Knowing God) but, except for chapter three of that famous work, I was always under-impressed. (Gasp. I know Packer is beloved by many!) Here, Packer himself notes that this is “sharp-sighted, deep-diving, wide-ranging, contemplative, whose wisdom is flavored by a mellow astringency that is all his own.” Too bad J.I. didn’t used to write like that! Fortunately, Galli does, and this is a lovely, rich, and interesting book designed to add to what John Ortberg says (in the forward) is “part of the longest and most important conversation held by the human race: What is God like?” Listen in and join the conversation. 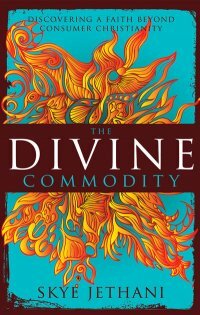 Shouldn’t any book titled “The Divine Commodity” at least be available as a free download?